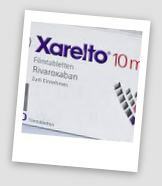 Xarelto is a new type of blood thinner approved in 2011 by the Food and Drug Administration and marketed in the U.S. by Johnson & Johnson’s subsidiary company, Janssen Pharmaceuticals. When a person is taking blood thinners they must have routine blood tests and make adjustments to their dosage. They also must watch the foods they eat. This is part of Xarelto’s main selling point: it is a one-size-fits-all medication. Unfortunately, this characteristic is what also makes Xarelto dangerous. Xarelto consumers have filed lawsuits alleging that the drug manufacturer failed to properly warn about some of the risks. One of the most dangerous side effects of Xarelto is uncontrolled bleeding. Unlike other blood thinners, Xarelto has no antidote which makes stopping the bleeding difficult. In one recent lawsuit, Ruth McGowan filed a lawsuit on behalf of her deceased father, Thomas Dunkley. McGowan’s father took Xarelto to reduce the risk of stroke. However, he suffered serious bleeding in the brain after a taking the drug for a month. The lawsuit accuses the makers of Xarelto of not properly testing the drug and concealing safety risks. In another recent lawsuit, Nancy Packard sued the makers of Xarelto for failing to warn about the lack of an antidote for the drug. She filed the lawsuit on behalf of her husband. Her husband took Xarelto for six months for atrial fibrillation and shortly after, he suffered bleeding in his brain. Doctors tried to save him by drilling a hole in his skull to alleviate building pressure but were unable to stop the bleeding, and he ultimately died. There are currently 5,381 lawsuits pending in United States District Court of the Eastern District of Louisiana. Dr. Shezad Malik law firm is currently investigating Xarelto lawsuits from across the country. If you or a loved one was suffered from excessive or uncontrolled bleeding after taking Xarelto, contact our office immediately.